Weibo Medical Care is a privately held company in Flushing, NY established in 2011 and incorporated in NY. 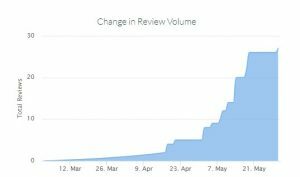 A drastic improvement in review volume as shown on the figure above resulted in 270% increase at 5.0 star rating. At this rate of the feedback we are getting, the astounding positive reviews with zero negative feedback shows that we are likely to triple our goal or reach 300% in a month. The graph will tell us that the overall star rating by week is consistently trending up. 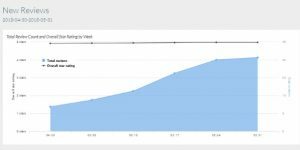 The Reputation Management campaigns have continuously yielded a very good result at 54% conversion based on unique visits. Our strategy includes planning the email sequence and creating a newsletter that is tailored fit to the type of responses or the user’s engagement rate. It is also equally important to craft a good content and professionally design your review invitation. While we want to achieve the highest conversion possible, it is critical to first establish your brand to your customers. Online Reputation Management is not only having control over the reviews that goes on the Internet, but rather it is making sure that you hit two birds with one stone or even more. What this means is that in running a campaign, you actually obtain positive reviews, strengthen customer loyalty in the process and most of all protect your online reputation from fake negative reviews.